What’s not to like about Google? It’s simple, you always get some kind of answer and almost everyone uses it. Usually, you get an answer on the 1st page. But, what if you don’t get an answer that helps you right away? If you’re like me, you have to start searching again and again – which can be very frustrating. That’s why I wish Google would check out Clusty. It’s not as big as Google or as deep. 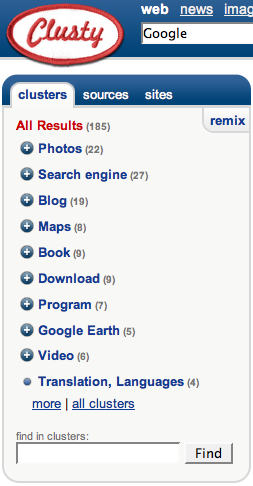 But, it’s interesting – because it ‘clusters’ answers, providing another ‘filter’ to make your search easier. On Google, if you enter your name, you’ll get a list of the most visited sites that include it. On Clusty, your might find choices that might differentiate your professional skills, golf tournaments you have played in or articles you have written. Clustering might provide an edge in behavioral targeting, the much touted ‘next generation’ of internet advertising which attempts to link a consumer’s ‘behavior’ (such as the pages they visit in searching for a new Audi) to more effective and targeted ad displays. A more differentiated search is a powerful tool. Google might want to try a Beta version.